UF Health Heart & Vascular Hospital and the UF Health Neuromedicine Hospital. On Dec. 10, a journey that began in January 2015 will mark a major milestone when patients arrive at the new UF Health Heart & Vascular Hospital and the UF Health Neuromedicine Hospital. While the event marks the end of the first phase — construction of the two leading-edge hospitals — it is just the beginning of the real work: saving more lives. These new specialty hospitals adjacent to the UF Health Shands Cancer Hospital will allow UF Health physicians, nurses and other healthcare providers to save and extend more patients’ lives, advance UF Health’s research and education goals and enable a new phase of robust growth for the health system. UF Health in Gainesville has the collective resources to be the state’s only academic health center that admits patients from all 67 Florida counties each year, in addition to serving patients from throughout the Southeast, the nation and several other countries. The new hospitals’ numbers are impressive: the new facilities occupy 521,104 square feet, there are 216 total beds, the parking garage has 600 spaces, there are 380,000 bricks in the buildings. But they tell only part of the story. The hospitals were built in response to the exponential growth in the number of complex cardiac and neuromedicine cases throughout Florida and beyond. The goal of building the new hospitals was to provide streamlined access to highly specialized, comprehensive outpatient treatment options and inpatient services in one location. Mission accomplished. The flow of the hospitals, from the parking garage all the way through to the state-of-the-art patient rooms, is the result of careful planning and design work that emphasized the role of sometimes unstated but still vital healing qualities such as the use of green space and large windows. Thomas Beaver, M.D., M.P.H., a professor and chief in the division of thoracic and cardiovascular surgery at the UF College of Medicine, looks forward to continuing to provide cohesive care for patients in a high-tech environment. He added that the medical and surgical clinicians practice “team-based care with minimally invasive approaches.” All cardiac studies — like CT scans and echocardiograms — are down the hallway from clinics on the first floor. Five hybrid operating rooms will allow surgeons to treat cardiovascular, thoracic and neurology patients who need both diagnostic and surgical interventions. 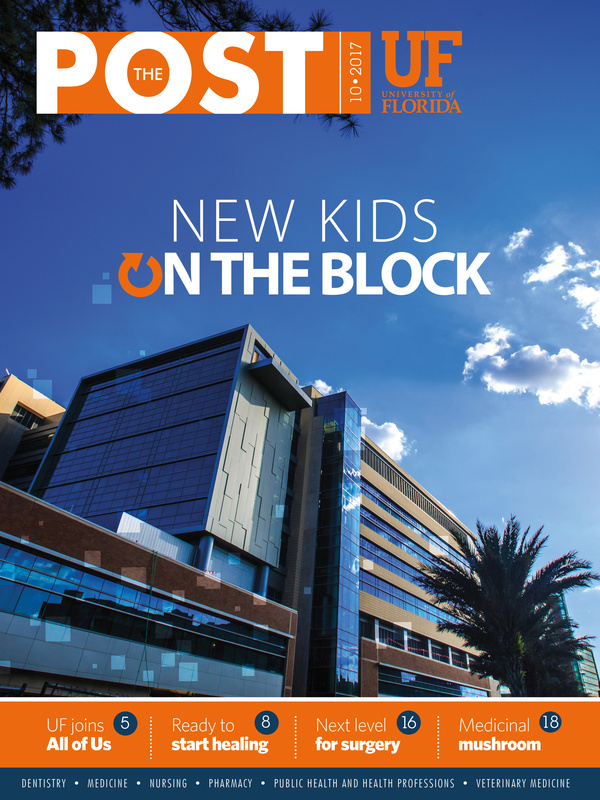 For Kim Bain, ARNP, who works in the cardiovascular clinic at UF Health, one key design element of the new hospitals makes a huge difference in how the medical teams interact. Clinics located in proximity to one another foster collaboration between cardiothoracic surgeons and heart failure cardiologists, she said. Patients will also benefit from the ability to receive care in one location — rather than at multiple clinics. “Cardiovascular and thoracic patients, like those with heart failure, often need the care of medical and surgical teams. It will be easier on patients if they’re able to get all of their care at the same location,” Bain said. Bain also said the aesthetics of the new hospital “are stunning.” Outdoor spaces, windows and terraces will let in natural light. All-private rooms with interactive technology will improve the overall patient experience in the hospital, she noted. UF Health’s new neuromedicine hospital will offer today’s most advanced and comprehensive approach to treating neurological and neurosurgical conditions. Physicians, nurses and technicians will work together in one centralized location designed not only for the ideal patient experience, but the ideal experience for a patient’s family as well. Neurology team members Katharina M. Busl, M.D., division chief of neurocritical care, and Brandi Kenworthy, ARNP, nurse practitioner for the UF Health Shands Comprehensive Stroke Center, say while an unplanned hospital stay is never easy, the many outstanding features of the new neuromedicine hospital will translate into a transformative experience for patients as well as loved ones. Return outpatient visits will become easier as well, as patients will be returning to the same location, adds Kenworthy. “Patients will have all their resources in one place,” she says. Kenworthy feels the excitement of leading the way in the future of neurological care. — Katharina M. Busl, M.D. At UF Health’s new neuromedicine hospital, the neurosurgery team is striving to create the best possible patient experience — down to the smallest detail. The new hospital will bring state-of-the-art technology and true interdisciplinary care between neurologists and neurosurgeons for patients facing conditions such as stroke, brain aneurysms, traumatic brain injury, spine disorders, movement disorders and brain tumors. Neurosurgery team members Brian Hoh, M.D., a professor and associate chair of UF’s department of neurosurgery, and Justine Abram, R.N., nurse manager of the neurosurgery medical surgical unit, note that in the past, patients would have to go to different locations to see a physician, get an MRI scan and undergo other tests. The new hospital will offer more of everything: more beds in general rooms as well as in the intensive care unit, more operating rooms, more radiology suites and more clinic space. Much of the anxiety of a hospital stay is caused by a loss of control. But at the new UF Health Heart & Vascular and Neuromedicine hospitals, patients will regain some of that sense of self-determination by using a couple of familiar tools: a TV set and computer tablet. Each of the 216 private patient rooms at the new hospitals will be equipped with an “infotainment” system, linking a bedside iPad to the widescreen TV on the wall. In a sense, it puts patients back in their own living room. They will be able to push content from the iPad to the TV, using their online accounts such as Netflix or HBO. They also will be able to surf the web and check email or dial up the latest cat videos on YouTube. That is the “tainment” part of the equation. The “info” part transforms the experience of a hospital stay, Pollitt said. Patients can order a hospital meal by calling up a menu, communicate with their health care team, review educational videos or their care plan, and access medical records, among a variety of offerings. Patients also will be able to control their window blinds and the room’s thermostat. Not all services will be available immediately as the system comes on line, Pollitt said. The system has been up and running in 92 hospital rooms at UF Health North in Jacksonville since May. It’s been a hit with patients. UF Health Shands ultimately hopes to expand the system to other facilities. When Elba Cruz, R.N., goes to work in the operating rooms at the new UF Health Neuromedicine Hospital in December, she’ll be surrounded by leading-edge equipment. Two of the new operating rooms will have intraoperative MRI equipment, allowing physicians to create real-time brain images and better overall outcomes. There will be seven neuromedicine operating suites with the latest design, including two interventional operating rooms. After surgery, patients can rest and heal in one of the hospital’s 96 beds, which include 48 private inpatient rooms with family accommodations and a thoughtfully designed 48-bed intensive care unit. Still, not everything will be new — and Cruz wouldn’t have it any other way. She has spent nearly 17 years in the operating rooms at UF Health Shands Hospital, starting her career as a surgical technologist specializing in neurosurgery. After returning to school, Cruz knew exactly where she wanted to use her new nursing degree. In August, she started working as a neurosurgery operating room nurse. For Cruz, the combination of a new hospital with progressive equipment and experienced, dedicated physicians will be a perfect fit. Early in her career, she worked with world-renowned neurosurgeon Albert L. Rhoton Jr., M.D. She’s now part of the nursing group that supports UF Health neurosurgeons, who perform approximately 600 brain tumor operations and 10,000 neurosurgical procedures annually.